Click Oliver Cromwell (who once lived here) to go to contents list. 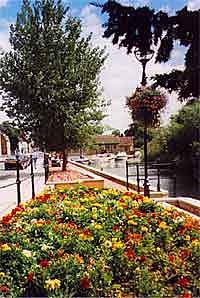 There are short riverboat trips from the Quay from April to September on Saturdays, Sundays and Bank Holidays, departing on the hour from about 12 noon to 4pm. They are interesting and informative, and to be recommended. 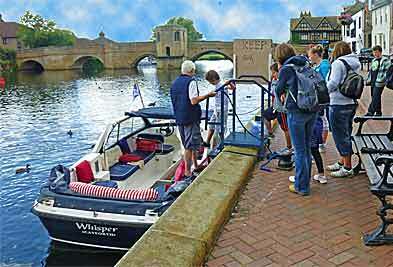 For more information, contact the St Ives Electric Riverboat Co at 07906-257308. 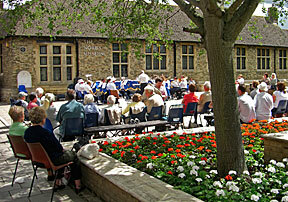 Sunday afternoon concerts are held on The Waits in the summer. Altogether, it makes St Ives seem a very different place from in winter! The Norris Museum is in the background. St Ives is a mass of flowers. This is The Waits again. St Ives is well placed climatically - it isn't often overcast and gloomy, not in the summer anyway! 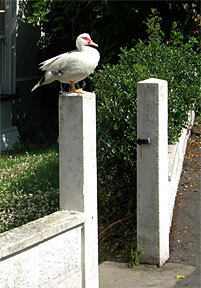 St Ives is strong in ducks. These photos were taken in Church Street in July 2008. 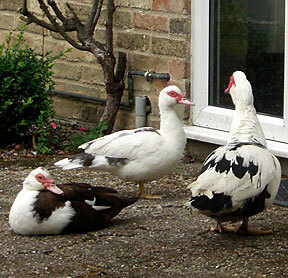 In the picture on the right, the ducks are waiting outside a house where they know they will be fed.